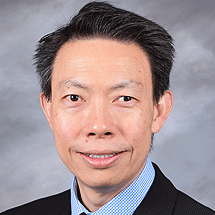 Dr. Tran serves as Chief of Psychiatry for UCSF Fresno, where he is a Clinical Professor of Psychiatry. He is also Medical Director of the Fresno County Department of Behavioral Health. A graduate of Santa Clara University and St. Louis University School of Medicine, Dr. Tran completed his residency training at Washington University in St. Louis, and a Fellowship in Geriatric Psychiatry at the University of Washington. Before joining UCSF, Dr. Tran was most recently an Associate Clinical Professor in Psychiatry at the University of Washington School of Medicine. He is board certified in General Psychiatry and Geriatric Psychiatry.